As adults, it is hard to remember the struggle in learning to read. Knowing how to build your child’s literacy skills can be a challenge for any parent. Here are the top 5 tips to help support your child’s reading at home. Reading has proven to have many cognitive benefits—not only for children, but also for adults. Increased concentration, mental stimulation, vocabulary expansion, memory improvement and the building of knowledge are just some of the benefits of reading. 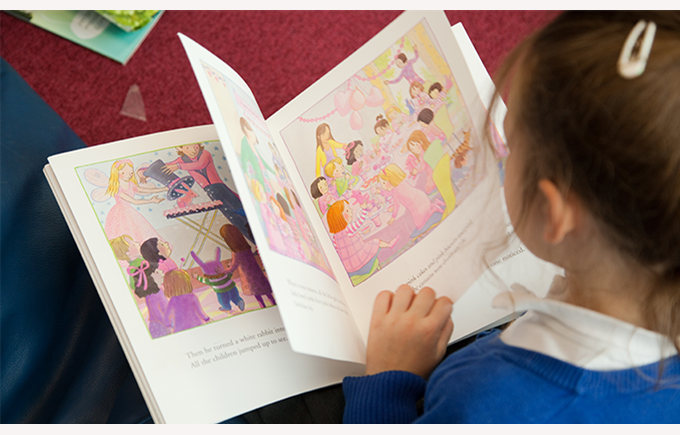 Below are the top five tips to support your child’s reading at home. Encouraging your child to read everything they come across will stimulate their curiosity for the world around them. For example, when children start to read newspapers, magazines or even store names, they will begin to make connections between words and their understanding of the world. Making reading fun will help your child practice spelling and leave them feeling more engaged. Spelling games also help to reinforce familiar spelling patterns. Hundreds of spelling games can be found online, but some of the classics include Hangman, Text Twist and Word Search. Children respond to positive reinforcement. If your child appears intimidated to reading longer books or words, encourage them to take it one step at a time. Instead of reading an entire chapter of a long book, perhaps you can challenge them to reading just one page or one paragraph of a book. If your child has problems reading a new word, you may want to help them sound out each syllable and explain the meaning of a word. Set time aside so that your child can curl up on a couch to read. Spending quality time next to them reading and letting them know that they can ask questions also reinforces a positive association to reading. By creating an environment which makes reading enjoyable and relaxing, your child is more likely to read without seeing it as homework or a chore. Books do not always have to challenge a child. Encourage them to just read and explore the story and ask them what they think about the book. Parents can be the best promoter for reading. When children see their parent’s enthusiasm for a book, a story in the newspaper or magazine, they are more inclined to be interested in reading the same story. If you happen to read something interesting on the internet, or in a book, share with your child why you found it interesting and incite a discussion around the topic. You can also ask your child to help you choose a book that they are excited to read. Our Global Campus supports your child’s reading with recommendations for all ages across genres, subjects, and countries. Your child can log on to the Global Campus website to explore the latest reading list and recommendations. Search #GlobalLibrary to see what our students are reading around the world.